Wow, it's Monday again! I don't know about you, but the weekends always seem to fly by, especially when I'm mega busy. Apparently weekends are made for relaxing. But who am I kidding. Weekends are the time for me to edit (stacks of) images, try and answer some emails (I don't think I'll ever catch up on my inbox) and try to get out of my 'office' (aka home) to soak up some new inspiration - the latter being the relaxing part, even if I always have blogging in the back of my mind. Anyway, more of all the above over the next few days! For now I thought I'd show you the newest lovely addition to our home. 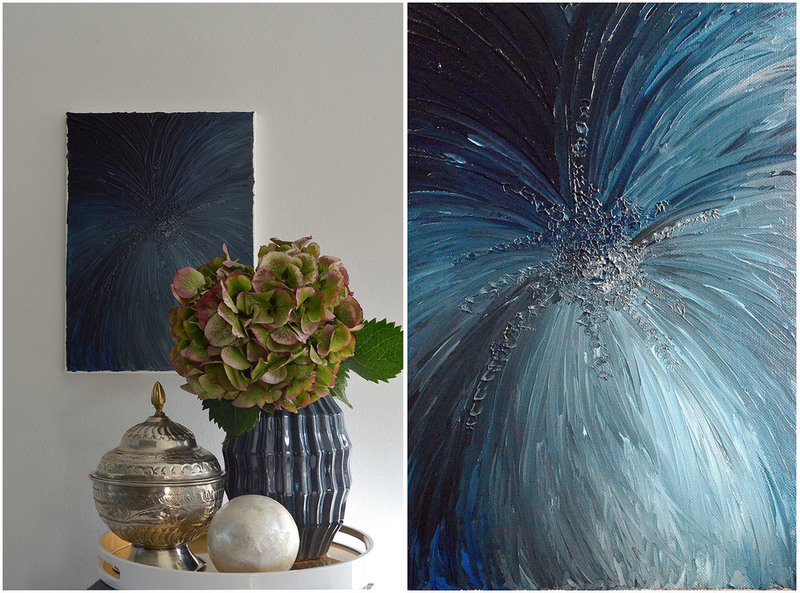 You already know of my love for the colour blue - and if you don't then check it here - and when I saw this vase, I fell for the colour as well as the shape and texture. Something was missing though. It was sitting there on the tray looking quite nice, but somehow 'detached' from the rest. That's when I thought I needed a small piece of matching 'art'. So, I got out a canvas (I have those lying around at home, don't you? ), my acrylic paints and a palette knife and went to work. And this is the result. I'm not usually somebody who paints in an abstract way, I much prefer portraits, but this just seemed right. The aim was to echo the textures and colour variations from the vase and create a reference between the vase and the surroundings. What do you think, did I nail it?